ShareGate Can’t open a website – IN-017-006 The requested list or document library cannot be found. It may have been deleted. The solution, after much trial and error, was actually pretty simple! 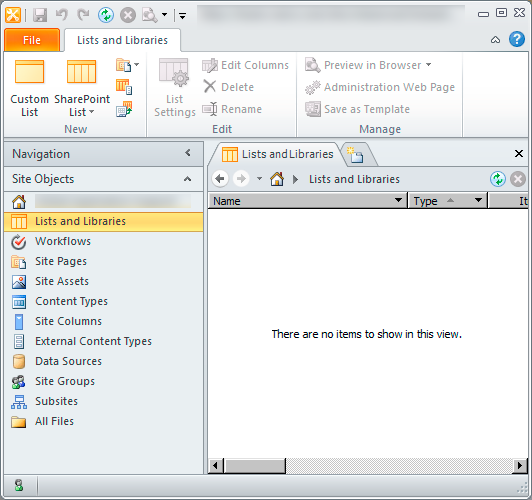 I searched the term “there are no items to show in this view” for SharePoint Designer on the internet. This turned up a few possibilities – one being a corrupt /_vti_bin/Listdata.svc. That wasn’t the case for me- some webs from the same site collection worked just fine – it was just one specific web that did not. The other thing that turned up was the possibility of a corrupt list. Often due to a missing feature needed by the list. I was definitely on to something – there was something wrong with one of my lists. Next I needed to figure out which one. There are a few ways to do this – the easiest would likely have been to go to the website and choose “Site Actions”->”View all site content” and then just click on each one. Instead I mucked with PowerShell some more, I was able to tell from the error when I ran my above code which list was causing the problem. My next step was to see if there was any data in the list. Based on “Site Actions”->”View all site content” , it had an item count of zero, but I wasn’t sure I could trust this given the list was corrupt. This listed a few results, but the results looked like what is usually found in the Forms folder – I didn’t for example, see anything at all that looked like end user data or documentation. Armed with this re-assurance that the list was not needed, it seemed the easiest way forward was just to delete the list – this would be easy – or so I thought…. I saw a delete method, so I called it without the ( ) to see what it was looking for, It needed a GUID. I ran the command shown below to get a list of ID’s from my site – in my case, the second list was the corrupt one. I found a post that mentioned the recycle bin. Ah Ha! I looked at “Site Actions”->”View all site content” and then the recycle bin, which of course was empty. So I went to Site Actions -> Site Settings -> then went to “Go To Top Level Site Settings” -> then Site Collection Administration(heading) ->Recycle Bin. After sorting by URL, I found the corrupt list there. First I tried restoring the list, it threw an error. Then I tried to delete the list – that worked, and put the item in the Second stage recycle bin. Next I went to the 2nd Stage “Deleted from end user Recycle Bin” area and deleted it from there. Back in Site actions -> “View all site content” the list no longer showed up. I relaunched SharePoint Designer and I am again able to bring up the list of lists and libraries. I again tried a migration in ShareGate and it’s purring along like a kitten. So to make my long story short, the error in ShareGate was caused by a corrupt/broken list – this same error affected SharePoint Designer (they both presumably use the same web service interface to get information from SharePoint) and to a degree, it even affected looking at the lists in PowerShell. I suspect there is a bug somewhere, but I suppose it’s possible the user hit delete at the exact instance the application pool restarted or something like that. At the time this happened we were running SP2010 SP1 + June 2011 CU – if you run across a similar situation, please leave a comment with your version of SharePoint, hopefully this is addressed in SP2! Wow Jack! Thanks for the feedback! Much appreciated! Hi, I received the same errors on several folders and items in a list. I noticed that the list view threshold was exceeded for users as well as auditors/administrators, so I bumped up the threshold, and the items are copying now. At least for me, I hope that exceeding the threshold was the problem.